A convivial morning with Mussels Fulfilling a long standing invitation from Francisco González and his wife Pilar a large group of members took the opportunity to visit their mussel farm at Cala Rata, especially with the season for harvesting mussels coming to its end on the 15th November. 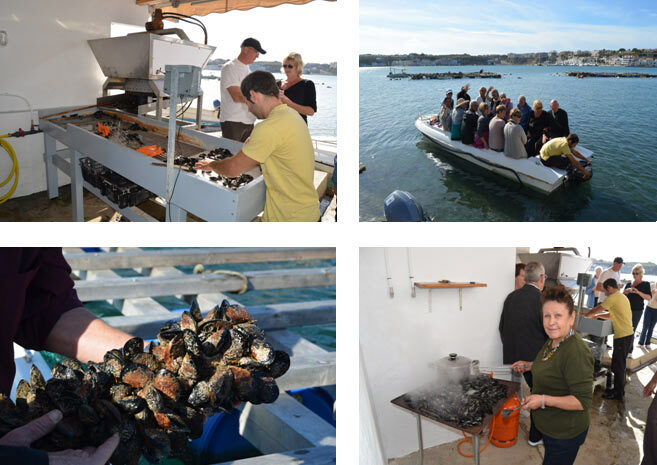 We were given a description of the processes involved of farming this shellfish and shown the machinery used in the preliminary washing and grading. Then in two groups of 15/20 we were taken in his boat around the rafts to see the long nets in the water close up and to harvest some. Then the best part, with the mussels washed and de-bearded they were quickly cooked on a griddle over a gas fire, “au natural”. With pan and mahonesa washed down by copious amounts of wine supplied by Menorca Britannia a very interesting and highly enjoyable gourmet morning was had by all. Please look out for the full description and the technicalities of mussel farming in a future edition of Focus.